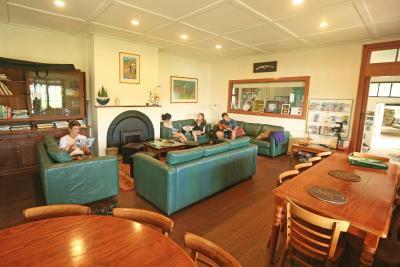 Lock in a great price for Sydney, Pittwater YHA – rated 8.5 by recent guests! Great managers. Great volunteers and amazing visitors. Good sense of team in best collective spirit. Records of previous visitors and activities including botanical and herpetologist blogs. Great surroundings. Innumerable hikes, trails, kayak routes, aboriginal sites. No shops, no urbanisation, no easy access means you have to plan ahead, organise and commit to the experience, which is great for the soul. You have to live on nature's resources, with rain water and self-closing taps that invite for energy-saving and waste-awareness. Plenty of spiders, snakes, jellyfish and a myriad of birds and insects to remind us that this is a shared world and that human conventions, concerns, ideas, values, cultural and legal systems, borders are nothing but petty unimportant details and narrowsighted caprice in the midst of bigger nature and mother evolution. Peaceful, calm, amazing for intellectual and spiritual inspiration. Best hostel I have been so far. We were looking for a place to escape Sydney just for the time of a weekend, enjoy nice walks in the nature and do some kayaking and stuff. Pittwater YHA was just perfect !! We had the most beautiful weekend, surrounded by like-minded people (couples, families, small group of friends), and felt so refreshed after only 2 days... We'll definitely go back as soon as possible! Fabulous location. Clean and well cared for. Quietude. Hardly anyone else there. Fire in common room. The journey there via ferry then on foot. Some great original artwork on walls and doors. Beautiful location Very clean. Make sure you bring food the hostel is only accessible by ferry, We’ll be back!! Beautiful location, friendly staff, good facilities- love it all! The sustainability quotient, the friendliness of the staff,the ambience and overall experience. It’s okay clean and has nice breeze through the window. The location was stunning. Right in the national Park, we had visits from a wallaby and her Joey. The morning bay is very beautiful. It is suitable for hiking. Sydney, Pittwater YHA This rating is a reflection of how the property compares to the industry standard when it comes to price, facilities and services available. It's based on a self-evaluation by the property. Use this rating to help choose your stay! 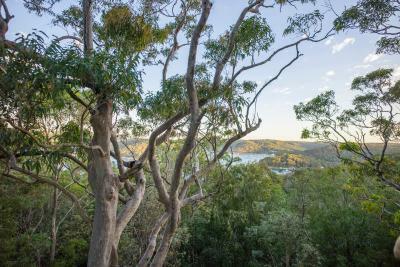 Located on a hillside overlooking Pittwater Harbor, Sydney Pittwater YHA is located next to the Ku-ring-gai Chase National Park. You can admire the amazing views over the bay and the national park from the terrace, or relax by the fireplace in the guest lounge. The BBQ area is the perfect place to enjoy a casual meal. The reception desk can arrange kayak rental, and provide information on visits to historic Aboriginal engraving sites. 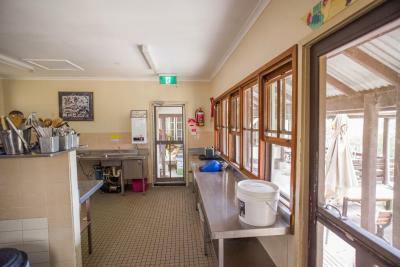 The property also provides a fully equipped kitchen, musical instruments, board games and guest laundry facilities. 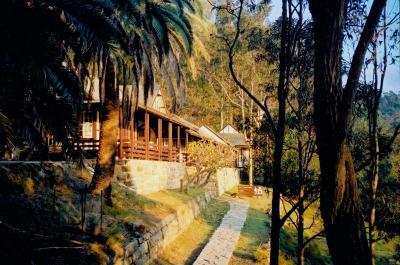 Guests can watch wallabies, native birds and possums from the terrace. 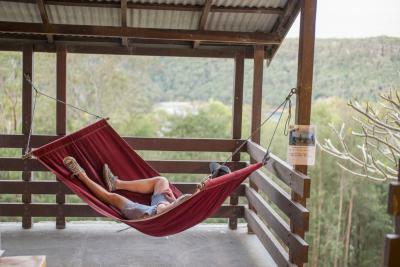 The hostel offers a choice of dormitory rooms and private rooms. Toilet and bathroom facilities are shared. 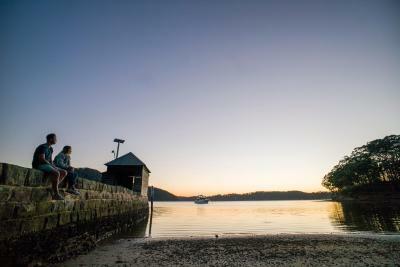 Pittwater YHA Sydney is accessible via water taxi or ferry only, followed by an uphill walk. It is a 19 mi drive from central Sydney to Church Point, followed by a ferry or water taxi from Church Point to Halls Wharf. It is then 10 minutes' walk from Halls Wharf via a bush track up. 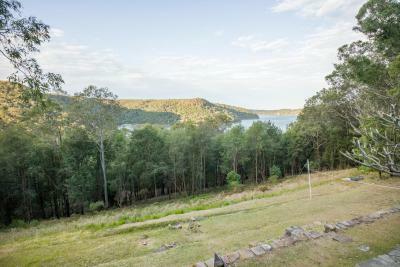 When would you like to stay at Sydney, Pittwater YHA? This is a private room with shared bathroom facilities. Please note that linen is not provided. This is a male-only dormitory room with shared bathroom facilities. Please note that linen is not provided. This is a female-only dormitory room with shared bathroom facilities. Please note that linen is not provided. This is a dormitory room with shared bathroom facilities. Please note that linen is not provided. Swamp wallabies graze in front you and bird calls surround you. Look carefully and you’ll see the rare glossy black cockatoo. 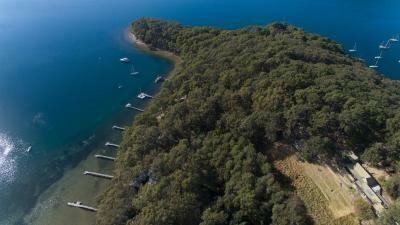 Sparkles of sunlight bounce off Pittwater Harbour and entice you for a kayak ride. 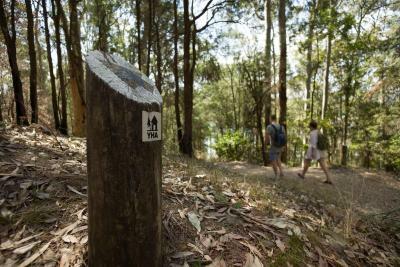 There are no roads and no cards, you just catch the ferry and take a walk through the spotted gum forest to reach us. We invite you to this unique place of natural beauty. 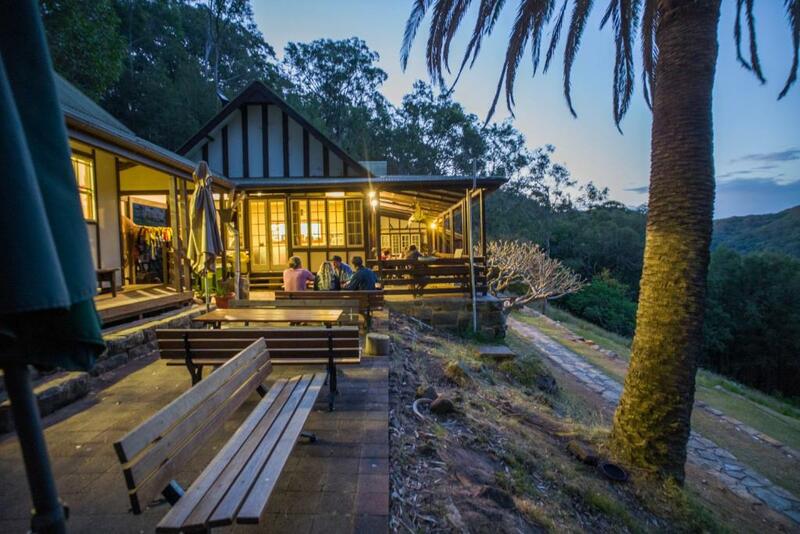 We look forward to meeting you, Sarah and Michael – Pittwater YHA, Hostel Managers. House Rules Sydney, Pittwater YHA takes special requests – add in the next step! Sydney, Pittwater YHA accepts these cards and reserves the right to temporarily hold an amount prior to arrival. Please note that you cannot drive to the hostel, this property is only accessible via ferry/river taxi from Church Point. The last ferry on weekdays is at 19:00 and 6.30pm on weekends and public holidays. Water taxis are available until 22:00. 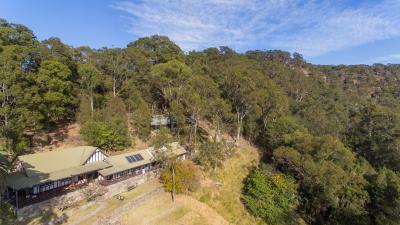 If you expect to arrive after 20:00, please inform Sydney, Pittwater YHA in advance, using the contact details found on the booking confirmation. Please note that bed linen is available at a surcharge, or you can bring your own sheets and pillow slip. Sleeping bags are not permitted. Please note that there are no shops to purchase food in the area. The closest shops are located in Church Point or Mona Vale. Nothing I didn't like other than occasional snoring of roommates. At one point kayaking back from the aboriginal petroglyphic peckled engravings, the wind was blowing hard against us in the oceanic waters in the bay where waves were forming, I was on the single-manned kayak and lost sight of my excursion mates. Felt a slint of dispair thinking of rolling over and falling prey to stingrays and the colonies of hundreds of giant jellyfish. But it just invited me to pull myself together and bring out the energy, force and courage to keep rowing harder and harder. The arrival at the hostel beach after almost 2 hours was glorious. among the best feelings I've had. The cleanliness of outdoor areas. The staff is quite slack, the volunteer was the only one there to help me when he arrived after hours from the time of my check in. Not a good value for money. We booked the place looking for some peace and tranquility but at the time there were couple of families with kids and they ran havoc all day. It's just bad luck. Don't think we'll be coming back on a weekend.